This book promises much and delivers even more. As a small business publisher and former agent, I was surprised to see a book that covers such a large territory for beginning writers. Not only is there guidance on writing the book, there is also a surprisingly complete treatment of problems authors encounter when try to get their books printed, promoted, and sold. I especially enjoyed Patricia’s quotation describing how an author typically feels about promoting their own books. She quotes children’s book author Sandra Cropsey as saying, in regard to marketing, “I would prefer to just have my teeth ground down.” And yet, as Patricia repeatedly warns, we must consider marketing at all stages of doing a book. After all, wasn’t it our purpose to have our books read? She quotes Robert Olmsted at Dan River press in Maine as saying, “…having a book published is not what authors need. Readers are what authors need.” And, unfortunately, for the 99.9% of us who aren’t published by major publishers, marketing is our only avenue to success. Many writers (and there are many, according to Patricia, who says “It is estimated that nearly eighty-one percent of adult Americans have the desire to write a book”) may have been poisoned against self publishing and self promotion due to a very negative history in the vanity publishing industry. Traditionally, any writing instructor would counsel against self-publishing, but developments in recent years have opened the door to many alternatives. 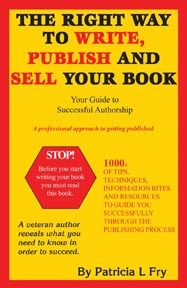 Further, this book gives how-to advice and ready-made contact lists for an aspiring author. There is no doubt that this book is an honest attempt by an experienced and respected book writer and publisher to help aspiring writers achieve success. No writer should be without this important work.